IMPORTANT: An updated version of this post is available here. As companion to my recently launched X-Men Read Order and Graphical X-Men Timeline, I decided to pick up essential issues and their related storylines from the X-Men Universe. This follows the read order scope, that is to say from Giant-Sized X-Men #1 to House of M.
All-New X-Men debut to save the original X-Men team. Jean Grey becomes the Phoenix. Jean Grey (eventually revealed to have been a Phoenix Force double) kills herself after becoming the Dark Phoenix. 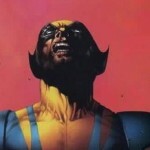 The full story can be seen in the “The Dark Phoenix Saga“. We see the first true glimpse into the many dystopian X-Men futures in this John Byrne and Chris Claremont classic. “Days of Future Past” continues in X-Men #142. Believing the X-Men are dead, Professor X forms the New Mutants are formed. Follow the full story in the X-Men’s original “The Brood” storyline as well as the first issues of “New Mutants”. This adds the first new ongoing title in the X-Men Universe. Madelyne Pryor meets Cyclops. They will eventually marry. Magneto takes over from Professor X as he leaves earth to heal. Meanwhile, Scott Summers’ son Nathan is born as Storm beats out Cyclops to take over as leader of the X-Men. Jean Grey returns, leading the original 5 X-Men to reform under the guise of X-Factor. Cyclops hence leaves Madelyne and his son, under strange circumstances. The “Mutant Massacre” begins as the marauders kill the Morlocks. This launches the first true crossover within the X-Men Universe. X-Men are believed dead following the “Fall of the Mutants“, launching major changes throughout the X-Men Universe, as Angel becomes Archangel in X-Factor #24 and Doug Ramsey dies in New Mutants #60. They will operate covertly with a headquarters in Australia. Madelyne Pryor is revealed to be a clone of Jean Grey, becomes Goblin Queen during Inferno. X-Factor and X-Men meet for the first time. The X-Men, escaping the Reavers in Australia, pass through Siege Perilous, leaving them scattered and changed, most notably Psylocke. Warlock is killed as Genosha, the Mutant/Mutate nation, erupts under “X-Tinction Agenda“. Nathan Christopher Charles Summers (Cable) gets sent to the future to be saved from the Techno-Organic Virus. 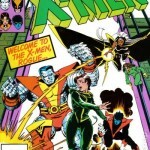 The various X-teams regroup to reform various teams after the return of Professor X during the “Muir Island Saga“, creating the New X-Factor, Gold and Blue teams of X-Men and X-Force. Bishop reveals the origins of a dystopian future which he is from, accusing Gambit of eventually betraying the X-Men. 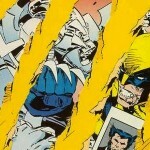 Stryfe, a clone of Cable, attempts to assassinate Professor X with the techno-organic virus during “X-Cutioner’s Song“. This first major crossover after the revamp of X-Men Universe titles ends with the release of the Legacy Virus, which only affects mutants. Magneto, having returned to earth and enrolled Colossus following the death of his sister at the hands of the Legacy Virus, strips Wolverine of his Adamantium. The full story is found in X-Men #303 and “Fatal Attractions“. Cable is confirmed to be the son of Cyclops who was sent to the future in X-Factor #68. The Phalanx Kidnap the X-Men, leaving Banshee and the White Queen to recruit young mutants who eventually become Generation X.
Legion, Professor X’s sun, goes back in time to kill Magneto, but mistakenly kills Charles, creating the “Age of Apocalypse“, an alternate X-Men Universe. This one-shot essential issue follows the reveal that Professor X is Onslaught, and plays out the events of which in Bishop’s time is known as the last days of the X-Men. Anti-mutant presidential candidate Graydon Creed, son of Mutant Sabretooth and Mystique, is assassinated, setting the path towards “Operation: Zero Tolerance“. Magneto is ceded the Island mutant nation of Genosha. Colossus sacrifices himself to gain a cure for the Legacy Virus. 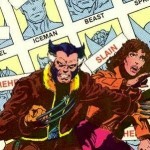 Following the revealing contents found in the Precog Destiny’s Diary, the X-Men. Apocalypse rises, but takes Cyclops’ sacrifice to stop him, melding the two beings and creating the “Ages of Apocalypse“. A group of X-Men Splinter off, in search of Destiny’s Diaries and begins a growing rift between X-Men as the School takes on more Mutants and Professor reveals his powers to the world. Cassandra Nova uses the Sentinels to destroy the Island Nation of Genosha and the millions of Mutants inhabiting it. The death of Jean Grey leads Cyclops and Emma Frost to formally couple and become Headmasters of the school. 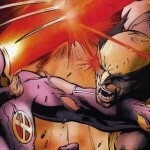 During the events of “House of M“, a deranged Scarlet Witch strips most mutants of their powers, leaving only 198 left. will this section be expanded to the stories leading to AVX or is this the end of the list with house of m #7? 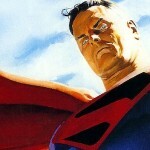 We don’t plan on updating much more past 2012 at this point, though perhaps we will at the end of the Marvel NOW! era.